On March 21, SUNY Oneonta’s Africana and Latino Studies (ALS) Club and the Poetry Slam Association (PSA) hosted an Anti-Racism Art Showcase. As a result of the collaboration of these two campus organizations, a friendly and safe environment was created for people of all backgrounds to share their beliefs and concerns about our society through diverse works of art and voices of poetry. 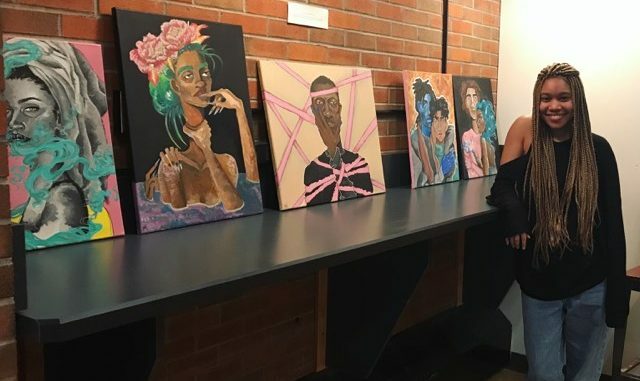 For example, one artist exhibited at the event was Janaya Josephs, whose art was exhibited at the event depicts people of color in scenes of every day life. Her colorful paintings functioned as great conversation starters. Art is an outlet for students to share personal experiences and it allows for people to touch upon one of the most impactful issues in the United States: racism. One of the reasons why the art showcase was planned is because of a recent incident at SUNY Plattsburgh. This past January, a student created a Snapchat post that related to the lynching of African Americans, and the post went viral on the campus. This post outraged the Plattsburgh student body and led to a student protest with around 400 people in attendance. Students were able to submit original works of art that touched upon a series of topics including colonization, terrorism, and privilege. To kick off the night, Gabe Membreno read a poem in which he explored his personal connection to Hispanic history and his roots. When delivering his message, Membreno wrote the memorable line “you Dominicans are so bitter,” which highlights the lasting effect that people’s judgments have on a person. The coffee metaphor also functioned as a connection to the colonization of various Hispanic cultures, where their labor was used as a way to profit off of coffee, a popular export. He also talked about how his name is an “old white name” and some of the impacts that has on his identity. After the first two performances, the hosts of the event asked the audience to get up and dance. The hosts were very attentive and checked on how the audience was feeling during this serious event through various “climate checks.” The mood was lightened throughout the room as the attendees and club members danced together to the songs “Alright” by Kendrick Lamar and the “Cupid Shuffle” by Cupid. After Kaur, another female artist, Malack Alharaizeh, took to the stage, putting an interesting spin on the assumed link between certain cultures and terrorism in the United States. She opened up to the audience and shared her experiences in middle school; being the one that everyone was afraid of because of her appearance. When Alharaizeh was being excluded, teachers ignored the problem and her friends were too afraid to help her out. What stunned the audience the most was that she recalled being asked to sit down during the World Trade Center remembrance ceremony at her school. The line, “For some of us every day is September 12,” had everyone stunned and truly opened up everyone’s eyes. For more information about the ALS and PSA clubs and on how to get involved in anti-racism events on campus, please contact Jillian Moczara and Emmanuel Woolard, or visit connect.oneonta.edu.